CSS: The cascading style sheet or CSS is the designing tool for modern web pages. If you wish to style your Custom Page Template then you must be knowing CSS. Again, w3shoools is the place for you to go. PHP: The backbone of WordPress! Obviously you won’t be making Custom Pages just for fun! You want to make it “do” something, right? That is possible only with a knowledge of PHP! Hey! Now don’t get scared! Even I was a noob at all these languages once. But with some effort, you can learn them and use them the way you want! For now, you only need to have a little knowledge on these languages to learn the basis of creating a WordPress Custom Page Template. Before we start here is a glimpse of what we are going to make actually. Your theme is the skeleton of your WordPress site. You need to understand the layout and (x)html markups to make your Custom page. Tip: Although, the theme can be analyzed from any page of your site, but the best place to look at is, the page.php file of your theme, which holds the default template. As said, let us first look at the page.php file of the Popular SimpleX theme. You see that, on the above code, the static part is <div id=”main”> <div id=”content”> ….Something dynamic here… </div></div>. Basically we can conclude that, these two divs are used as the content wrapper in this theme! Lets look a little further to examine our assumption. Very much straight forward… includes all the code from the footer.php file of your theme template. The above code starts the loop. if (have_posts()) : while (have_posts()) actually tells wordpress that if this page have post then loop it using while loop. the_post() globalizes the post in the current loop. Also, the wp_link_pages() links the child pages. This is something which we insert from the “Insert Page Break” from our WordPress Editor. More info about it here. Just ends the if condition and while loop on line 4. We will leave the Header and footer section intact. We will modify the content and the sidebar section to fullfil our need. Also we will add some interactiveness to our Page with some custom PHP code! As mentioned in the WordPress Page template guide we need to place the following code which will tell the WordPress the name of the Page Template. It will be shown on the Page Template dropdown menu from the Editor. As of the filename of the Template file, it can be anything.php unless the anything is not something mentioned here! Those are the default Template names used in WordPress themes. So naming your template to anything that, would tell wordpress to use that file for the relevant purpose! Seems simple enough! Now lets see how we can make, a full page and a normal Page Template. That’s it! Seems almost like the actual page.php right? Well it won’t, when we will add our custom PHP code. Now we have added a class fullwidth to the div#content. So here will be the CSS code to make the div actually full width. Just place this code inside your Style.css file. The overflow: hidden thing frames the wide column properly! This is the easiest part. Just upload the anything.php file to your Theme directory. Now you shall be able to use the Page template from your dashboard. 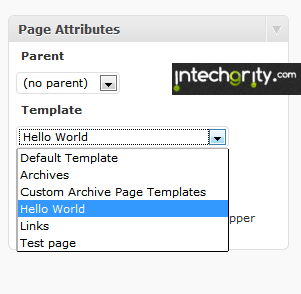 On the template dropdown from Page attribute, select Hello World. Publish the Page and see it your self. Quite effective isn’t is? The above package would give you a Full width Page template sample, the hello world page template and a normal Page template for SImpleX theme. Well that’s it! I didn thought that it would become so long! 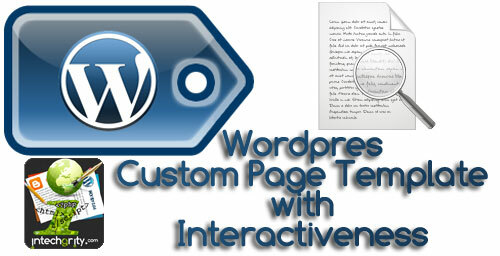 But now I guess, you would be able to make your Own Custom Page Template for WordPress! Dont forget to give your feedback. If you need any help, just feel free to drop in here! How could we add a gallery in a page for windows 7 themes.. I have been struggling for days, just to find a piece of code to make an interactive button for a wordpress site and I came across your page. I am not quite there. I need the button to be a dropdown select. I will try and adapt, but any help would be greatly appreciated. Love this piece of work and I was cracking my head for few hours and found this of work. I need to make a form on similar line, just manage to run your piece of code successfuly with 5 min. Appriiciate & great work. ! !